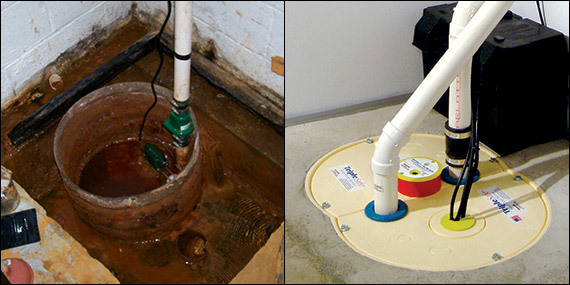 A sump pump keeps your home dry by automatically pumping and channeling water away from the foundation. If the sump pump fails, your basement can flood, causing expensive damage to your home and valuables. It's important to have a reliable sump pump that can help you protect your home in even the wettest weather. 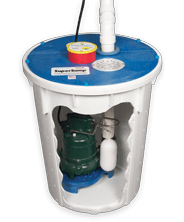 Click to learn about the different submersible sump pump systems available from Basement Systems. Ultimate Protection. With three pumps, it's the most reliable system available. Value. Removes up to 2,650 gallons of water per hour smoothly and quietly. Emergency Protection. Battery-operated pump turns on automatically if primary pump fails or during a power outage. Compact Pump. Ideal for water control in a crawl space and easily installs with a vapor barrier. 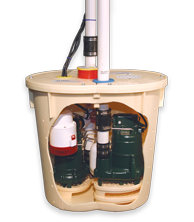 Basement Systems' sump pumps are available exclusively from local dealers throughout the United States and Canada. Find a contractor in your area who can help you choose the right waterproofing system for your basement or crawl space. Powerful pumps. 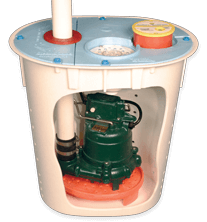 Each system includes a clog-free Zoeller cast iron pump with a mechanical float switch, designed to effortlessly handle high water volume and long run times. Attractive, airtight sump cover. A strong, airtight lid helps quiet the pump; keeps out bugs, odors and radon gas; prevents objects from falling into the sump pit, and keeps out moisture. Durable housing. The pump is housed in our rugged, heavy-duty polyethylene SuperLiner® that won't crack or cave in. An exclusive "pump ring" on the floor of the liner helps keep the pump centered. Emergency backup. 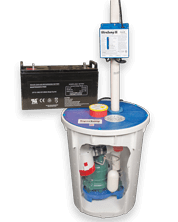 The UltraSump® battery backup pump is available to keep the system running during a power outage. This emergency backup is included with our TripleSafe® system. Built-in alarm. The WaterWatch® built-in audible alarm alerts if the water level in the sump pit gets too high, helping prevent flooding and water damage. The right sump pump system in your basement or crawl space can mean the difference between a dry home or thousands of dollars in flood damage. A quality sump pump is an investment that's worth making for years of worry-free flood protection and peace of mind. Contact us today to schedule a consultation with your local waterproofing contractor and get an estimate on sump pump installation or replacement.